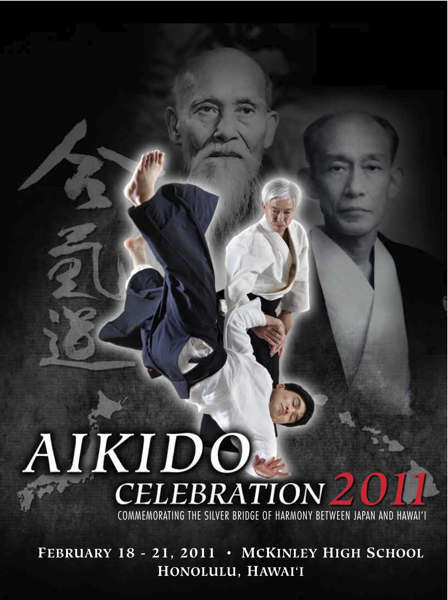 The cover of this commemorative brochure was modeled on the poster created for the event by local phtographer and Aikido student Ric Noyle – Ric also created an early mock-up that never saw the light of day. The main event of the actual celebration was a seminar in Honolulu, on the island of Oahu, at McKinley High School – the same place where Aikido Founder Morihei Ueshiba OSensei gave a public demonstration in 1961. Some 500 people from around the world attended the seminar, which featured instruction by Moriteru Ueshiba Doshu, Mitsuteru Ueshiba Waka Sensei, Yoshimitsu Yamada sensei from the New York Aikikai, Seijuro Masuda sensei from Aikikai Hombu Dojo, and a number of local instructors and instructors with local ties. Nobuyoshi Tamura had already accepted an invitation to instruct at the Aikido Celebration 2011 seminar, but passed away in July 2010, seven months before the seminar actually took place in Honolulu. In 1961 Morihei Ueshiba OSensei visited Hawaii in order to dedicate the newly completed Honolulu Aiki Dojo, the first Dojo outside of Japan built specifically for the practice of Aikido. Included here is the text of a short article that I wrote for the brochure about the two students of Morihei Ueshiba who accompanied him from Japan in 1961 on that journey – Koichi Tohei and Nobuyoshi Tamura. The photograph of Morihei Ueshiba with Koichi Tohei and Nobuyoshi Tamura at Honolulu International Airport that appears at the start of the article also appeared in the brochure. The other photographs have been added for this article. Koichi Tohei had been coming to Hawaii since 1953 – there is a small room in the Honolulu Aiki Dojo that was originally planned so that Tohei would have a place to stay when he came to visit Honolulu from Japan. Nobuyoshi Tamura was one of the young instructors at Aikikai Hombu Dojo, and this was his first trip to Hawaii. You may also be interested in reading these two articles in which Koichi Tohei recounts some of his experiences in coming to Hawaii, “Morihei Ueshiba: Untranslatable Words” (Nobuyoshi Tamura also appears in this account of the Founder’s visit to Hawaii) and “Koichi Tohei: Aikido Comes to Hawaii“. There is also a two-part interview with Nobuyoshi Tamura (part 1 and part 2) if you are interested in learning more about Tamura’s history in Aikido. Lastly, Ni-Dai Doshu Kisshomaru Ueshiba speaks about his first trip to Hawaii, in 1963, in “Kisshomaru Ueshiba, Mangos and Johnny Walker Black: Ni-Dai Doshu Comes to Hawaii“. 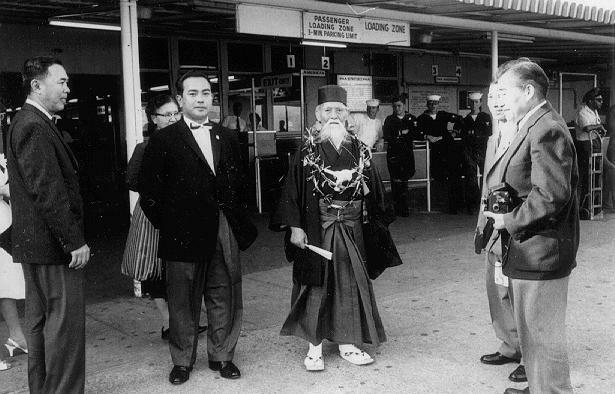 Aikido Founder Morihei Ueshiba arrived at Honolulu International Airport on February 27th 1961 accompanied by two Otomo (attendants), Koichi Tohei and Nobuyoshi Tamura. Koichi Tohei was born in Tokyo in 1920, but soon relocated to his home town in Tochigi prefecture. His father began to teach him Judo when he was nine years old – an attempt to strengthen him. He received his black belt in Judo at the age of 14 and continued his Judo studies when he returned to Tokyo in order to enter Keio University. In 1939, Shohei Mori, one of Tohei’s sempai at the Judo club, told Tohei about a teacher with phenomenal strength. With a letter of introduction in hand from Mr. Mori, Tohei went to meet Morihei Ueshiba and become his student. In less than half a year he became the founder’s representative (dairi) and, having yet to receive any official ranking in Aikido, was sent to instruct at the Nakano Police Academy and the private school of Shumei Okawa. He would study with Morihei Ueshiba for only one and half years before being sent overseas with the Japanese Army. It was only after he entered the army that he received his first rank in Aikido – a 5th dan. 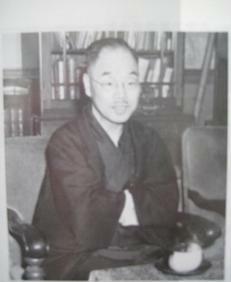 Tohei was demobilized in 1946 and returned to Japan to continue his studies in Aikido with Morihei Ueshiba and Shin Shin Toitsu-Do with Tempu Nakamura. 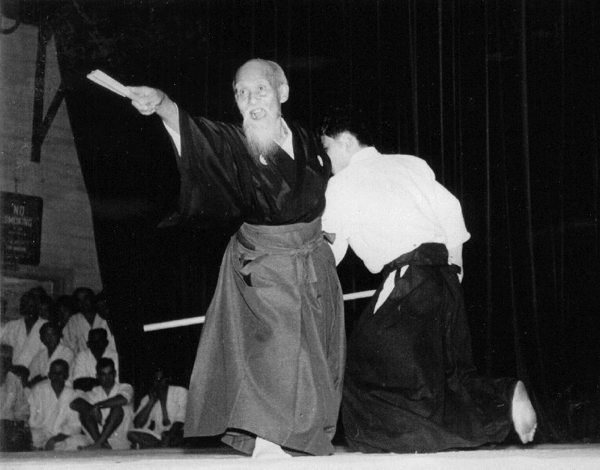 Tohei was promoted to 10th dan by Aikido Founder Morihei Ueshiba in 1969, and remains the only person to ever have been promoted to 10th dan through official Aikikai channels. 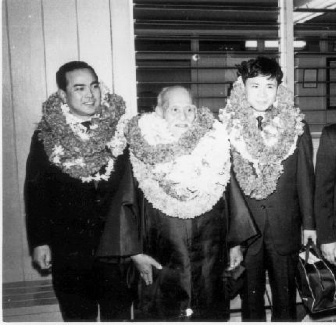 In 1953, at the invitation of the Hawai’i branch of the Nishikai health system, Koichi Tohei travelled to Hawai’i to introduce Aikido to the Islands. Tohei returned a number of times over the following years, and built a thriving community of Aikido dojo throughout Hawai’i. Nobuyoshi Tamura was born in Osaka in 1933, the son of a local Kendo instructor. After his father passed away in 1949 he was determined to become independent, but was often at a loss for a place to live. It happened that Seigo Yamaguchi, the first professional Aikido instructor in the Aikikai outside of the Ueshiba family, was returning to his hometown to get married, so he offered the young Tamura the use of his home for about a month. The month passed quickly and Tamura was soon looking for another place to stay, whereupon Yamaguchi suggested that he stay at Aikikai Hombu Dojo. When Tamura found out that he would be able to live at the Dojo for free he immediately entered Aikikai Hombu Dojo as an Uchi-Deshi in 1953. At that time there were at most 14 or 15 students at Hombu Dojo. Although Ni-Dai Doshu Kisshomaru Ueshiba taught most of the classes, the Founder’s house was attached to the Dojo, and OSensei would appear often to demonstrate techniques or lecture at length. 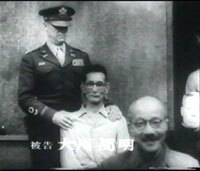 Tamura would often accompany the Founder as his Otomo and often appears as the Founder’s Uke in early films from this period. 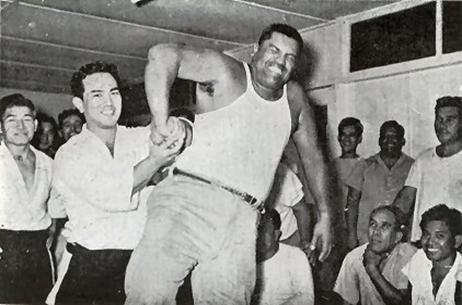 When Tamura accompanied the Founder to Hawai’i in 1961, he was immediately nicknamed “The Stone Wall” by the local students who found themselves unable to move him in any way. 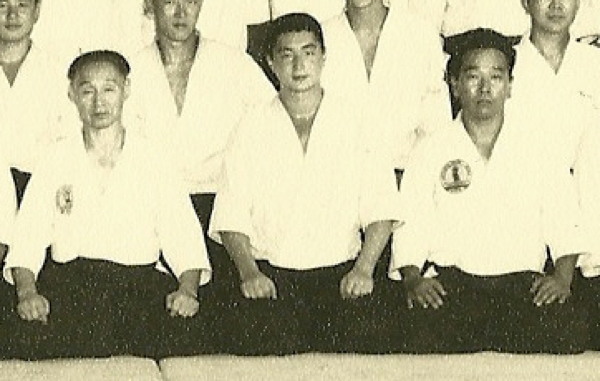 In 1964 Tamura married a fellow student from Aikikai Hombu Dojo. They departed on a honeymoon cruise, partially financed by performing Aikido demonstrations aboard ship. When the ship reached the final destination in France he decided to remain there teaching Aikido professionally, despite the fact that he could barely speak French at the time. Over the next forty six years he became one of the leading figures in European Aikido and authored several books on the art. Nobyuoshi Tamura passed away on July 9th 2010, shortly after having accepted an invitation to teach at Aikido Celebration 2011 in Hawai’i. 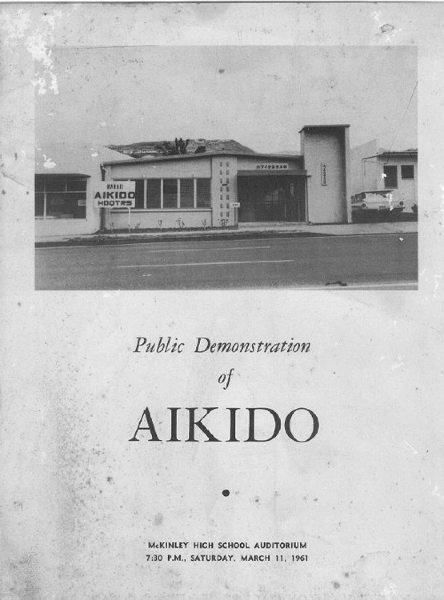 The opening of the Honolulu Aiki Dojo on Waialae Avenue (now Aikido of Honolulu) was an historic event in the transmission of Aikido from Japan to the United States. It represented the united efforts and sacrifice of the Hawaiian Aikido community to support the art that they loved. That harmony would be short lived, with various acrimonious disputes, even court battles, disrupting the Hawaiian Aikido community over the years. In 1974, Koichi Tohei resigned his position with the Aikikai Foundation in order to become head of his own Shin-Shin Toitsu Aikido. Koichi Tohei announced his attention to leave the Aikikai right here in Honolulu, at a dinner for then Doshu Kisshomaru Ueshiba. 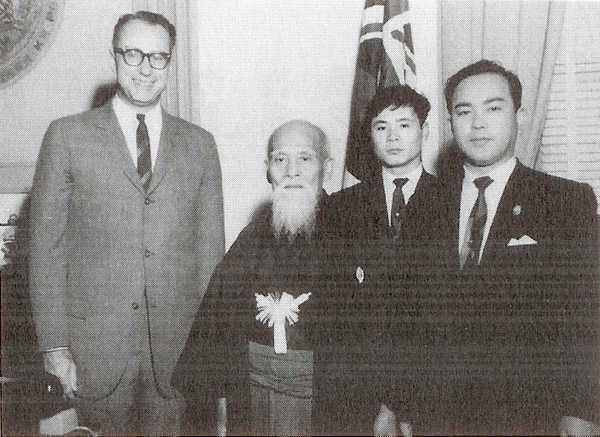 Many local practitioners felt a loyalty to the Aikikai and the Ueshiba family, while others felt a loyalty to Koichi Tohei, who had spent a considerable amount of time in the Hawaiian Islands over the years. Many of the local Hawaii instructors stayed with the Aikikai, while Shinichi Suzuki and others formed the Hawaii Ki Federation. In 1978 the second International Aikido Federation congress was held in Honolulu and hosted by the Hawaii Aikikai. Unfortunately that experience only served to exacerbate long-standing irritations between local instructors and started a long and steady deterioration between local Hawaii Aikido groups. 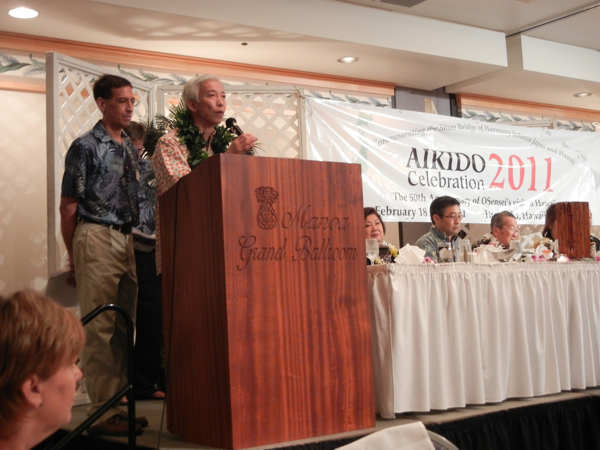 In 2009 some twenty of the local groups reached an agreement to cooperate in the planning and hosting of an event to commemorate the 50th anniversary of OSensei’s 1961 visit to Hawaii – Aikido Celebration 2011. Many of those groups hadn’t spoken to each other for many years, on an island that you can drive across in half an hour. Now, we are more than a year past the Aikido Celebration 2011 event, which went well – better than we had hoped, in many ways. Some groups renewed old friendships and grew closer, some found relations even more strained than before and have moved further apart. For the most part – things go on pretty much as they did before, with dozens of tiny groups that more or less ignore each other. It is very nice to see my old AikiWeb compatriot Chris Li published. Thanks Greg, hope you enjoyed it! The Aikido Sangenkai is a non-profit volunteer group in Honolulu, Hawaii dedicated to research and training in the art of Aikido. Please come visit us! Like what you're reading? Chip in a little bit to help support our efforts!